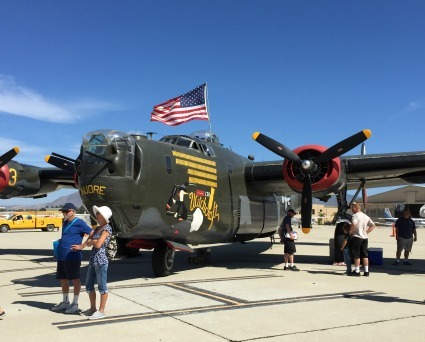 Two grandkids and I recently made the quick trip to the small Camarillo Airport to check out the World War II airplanes on display. All of us climbed up the ladder and through the B-24, which was the largest plane, but only Erica and James toured the smaller B-17. We also got to see a shiny Mustang fighter plane take off. 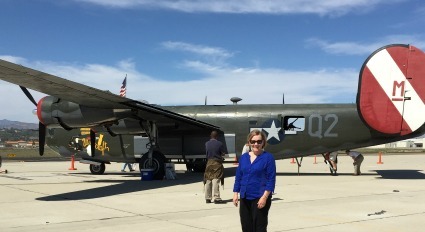 My Aunt Joey told me the B-24’s nickname was the “flying boxcar,” and I can surely see why. Its shape is wide and boxy to hold as many bombs as possible, with a plane weight of 36,000 pounds that could carry up to 30,000 pounds of bombs. The B-17 was a much tighter fit inside the plane with narrower spaces to navigate from front to back. On the plus side, the shape was much sleeker than the B-24. 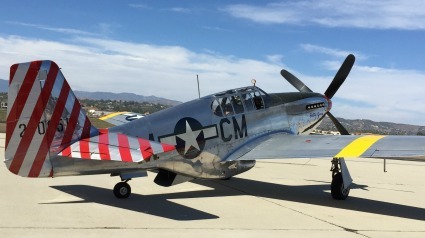 The other plane on display, the Mustang, reminded James of a go cart, I think because it was so small – not like the large jet fighters of today. And while James was commenting, Erica was busy snapping intriguing photos that I think could have been published in an art magazine. After seeing the 3 warbirds, I am in awe of the bravery it must have taken for each and every crew member to to climb into those planes and fly off on bombing or attack missions. I guess they must have been bouyed up by the common goal of helping our country prevail over the evil forces trying to take over our world at that time. This entry was posted in Uncategorized and tagged B-17, B-24, Camarillo Airport, Mustang Fighter. Bookmark the permalink.